Having wrestled control of the Eternal Throne from his father, Arcann pinned the ‘tragedy’ on Ravanor and as all the best villains do, he froze our unconscious hero in carbonite and poorly at that. It’s Chapter II of the Knights of the Fallen Empire! His eyes opened, at least he thought so, but he was not alone. Ravanor awoke on a nameless rock, held in stasis amid a raging battle; the still smouldering ships of the Empire and Republic, facing the unsullied craft of the Eternal Fleet. Off in the distance his companions stand locked in battle with unyielding Skytroopers. 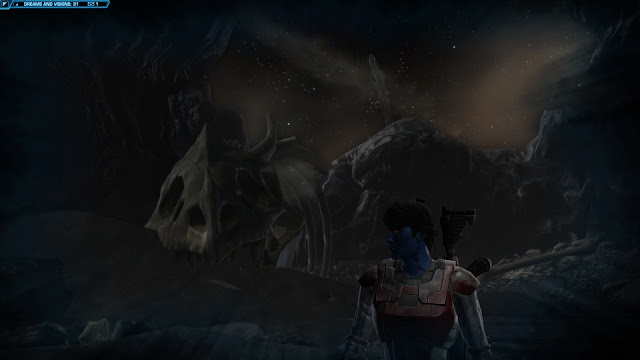 All was still, and Valkorion stood beside him, alive. Ravanor cannot decide whether Valkorion, Vitiate, or whatever his true form, has indeed taken root in his mind as a price for promised power, or if this is simply his imagination. Neither is comforting. Valkorion explains that the carbon freezing Ravanor underwent was imperfect; his body is poisoned and dying. Ravanor couldn’t help but feel a pang of satisfaction, knowing that if he died, so too would this strand of Valkorion, imaginary or otherwise. But he didn’t feel ready to give up on the living just yet. As he walked the surface of rock he was confronted by Skytroopers, his latest enemy, those he had fought prior to his incarceration, as well as spectres from the past; Watcher X, Hunter, people pivotal in the shaping Ravanor into the person he was. Ravanor fought his way to the site of his companion’s struggle, only to find lifeless bodies scattered across the ground. Did he fail them? Are they dead in reality because they are dead here, or is this a trick entirely of Valkorion’s doing? Gripped in pain his vision darkened yet further, until he awoke again, somewhere new yet terribly familiar. 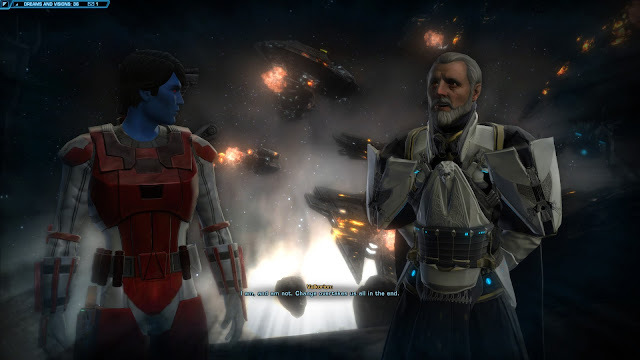 The Empire, its capital Dromund Kaas, but not as Ravanor left it, its buildings and statues hang shattered, capital ships fill the sky, the same unmoving devastation he witnessed on the nameless rock. Valkorion and Ravanor talk of the Empire, the Empire he forged as Vitiate and that Ravanor fought to protect and strengthen. It now lies shattered under the mighty fist of Arcann’s Eternal Fleet. They move again, this time into the city streets. Imperial soldiers and citizens crowded around, screaming at Ravanor, telling him that he failed them, that he should atone. And in way they were right, Ravanor began to regret his supplication to the Emperor. But then the screaming voices were drowned out by a different screaming, the sound of blasterfire. The soldier’s action forced his hand, he gunned the troopers down, and slaughtered yet more as he moved through the ruins of Kaas City. 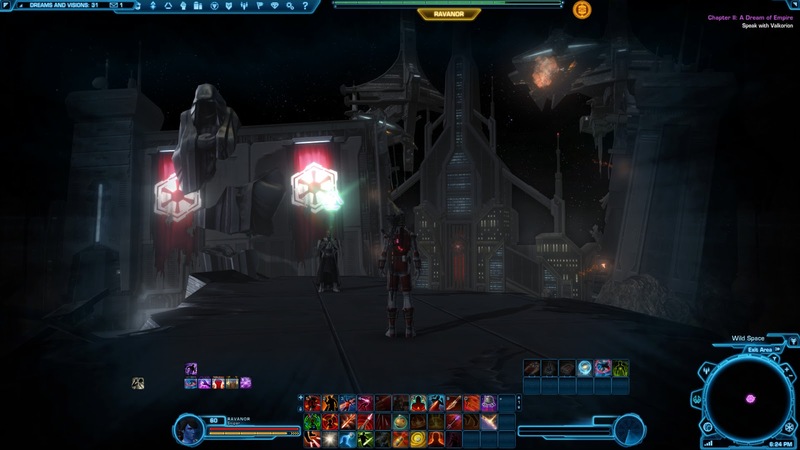 At the end of which stood Darth Jadus, the Sith lord who had attempted to re-forge the Empire with Ravanor’s help. He shot him dead too. A quick aside, the combat throughout both of these chapters has been trivial, like the low level action of the starting planets. I don’t think it’s a problem, in fact it allows the story content to flow more readily, which is after all the whole purpose of the expansion. Ravanor was crushed beneath a crumbling Imperial icon on the steps of the Citadel, the symbolism wasn’t lost on him. His eyes opened a new upon the lifeless surface of Ziost, the world sucked dry by Emperor Vitiate’s will, now patrolled only by the mutant Monolith beasts. He was confronted by such a towering monstrosity, a Monolith far larger than the one he downed mere moments before. Before the behemoth could attack, Valkorion halted the world around them and offered Ravanor a hint of his power, which he must have surely needed to defeat this beast. 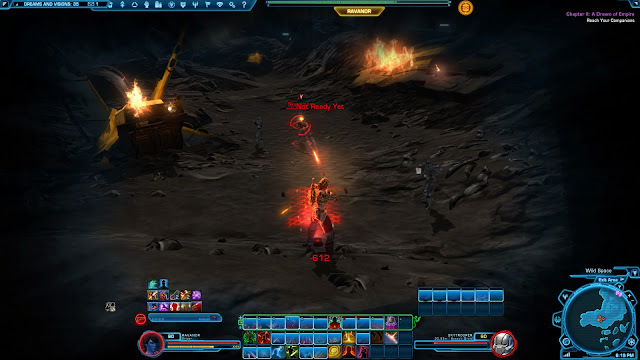 Ravanor refused, and trusted his life and Valkorion’s to his considerable skill with a sniper rifle. When the Monolith was downed the world shifted again, to the throne room above Zakuul, where Arcann sat, Vaylin at hand, and two representatives from the Empire and Republic knelt before them. Valkorion claimed his children have abused their power, hypocrisy if Ravanor had ever heard it. 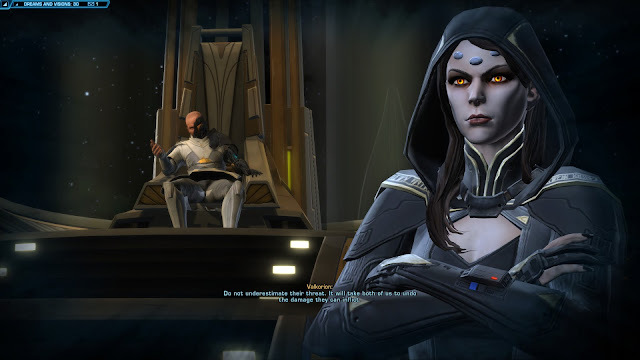 But their spectral presence doesn’t go unnoticed; Vaylin sensed their existence through the Force, though she did not inform her brother Arcann, she distrusts him. 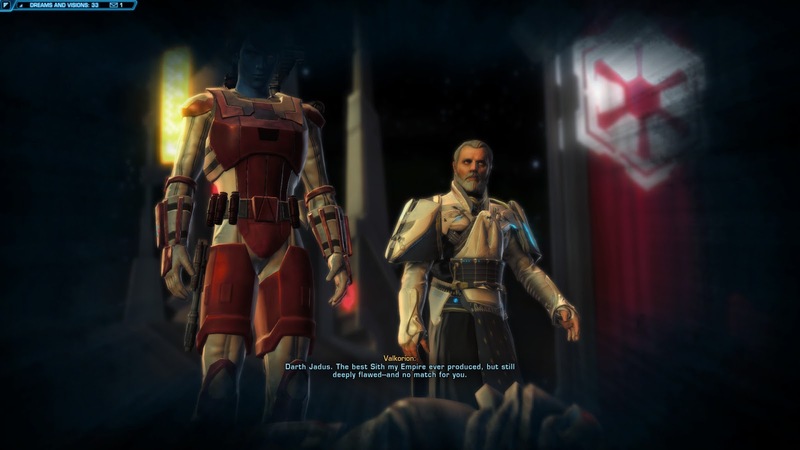 Vaylin plunged her yellow-bladed lightsaber into Ravanor’s chest and the world vanished into white. Again, Ravanor was not alone, he heard a voice, the familiar voice of Lana Beniko.